Yep, you heard it. The monday morning following friday’s game, the words “It was electric” seemed to echo through the hallways as head coach Robin Brawkett spoke on the intercom the following monday morning. It was as if the whole team running side by side was surged with electricity. They came to play. Despite the team’s 0-3 record at home, talk about friday’s game seemed to spark into conversations in every room. Teachers, students, alums of the football team last year had came to show their support of this cause. Gus meant everything to the fans, and we wanted him to know it. Special events were being held all week in preparation for friday’s game, such as “Grooves for Gus” and the new tradition of cupcake decorating. The time had come, and suspense from the fan section was building. It was time for kickoff, and the team wanted to know that this was the time to show their support for such a charitable cause. At the start of game, it is tradition for Gus to lead the team carrying banners across the field as people scream his name. Shortly after, a chant of “We love Gus!” erupted from the student section. Dozens of parents showed their love for their sons as their last Hope for Gus game was underway. 15 minutes later, the first quarter had came to a close, making Souhegan unable to put any points on the board. Lead by Gavin Urda, Milford’s offense was nothing short of organized and tactical. Hope for the win seemed to be dissipating, but that didn’t stop the Souhegan fan section from chanting. Many were said to have lost their voice in all of the commotion as they shared their spirits for the foundation. Let’s just say that the scoreboard didn’t necessarily represent the enthusia sm in the crowd. As the second quarter came to a close, the Sabers were down 28-0 at the half, Milford’s consistent scoring powered by Junior Ughu, a star running back for Milford High that seemed almost unstoppable. I stopped to ask one of the players on the sidelines about him. He said, “His biceps were as wide as my thighs… if he stepped near me, I let him by.” That wasn’t exactly the best news for Souhegan’s defensive line as they struggled to keep up. Number 9, a phenomenal track star lead the Milford High team with speedy quarterback Gavin Urda on the prowl. However, Souhegan also had a few trick players up their sleeves. Star player Trey Johnson lead the team in terrific plays as he scrambled down the sidelines, dodging the players with his quick feet. Not to mention our very own John Lohnes leading the team in pass completion, evasive as ever in the pocket. Throwing a bullet of a pass to number one, Tyler Hall for a 58-yard touchdown pass seemed to really boost the fans spirits as he reached the end zone. As the Milford team was on a mission to score every drive, their defense reciprocated the intensity. Samson Hodges of Milford lead the team in three sacks against the quarterback. A true sight he was, number 71 towering at 6’5” pushing through the Souhegan’s offensive line was one of the many challenges faced on offense. “We just have to play better, and work on protecting our QB more” said one of the linemen. As the players passed through the gates of the new stadium, their heads were held high, positive about the hard work and contributions they did for Gus. Despite the tough loss of 27-47 against their arch-rivals, the notorious Spartans, friday night’s game was nothing short of spectacular. 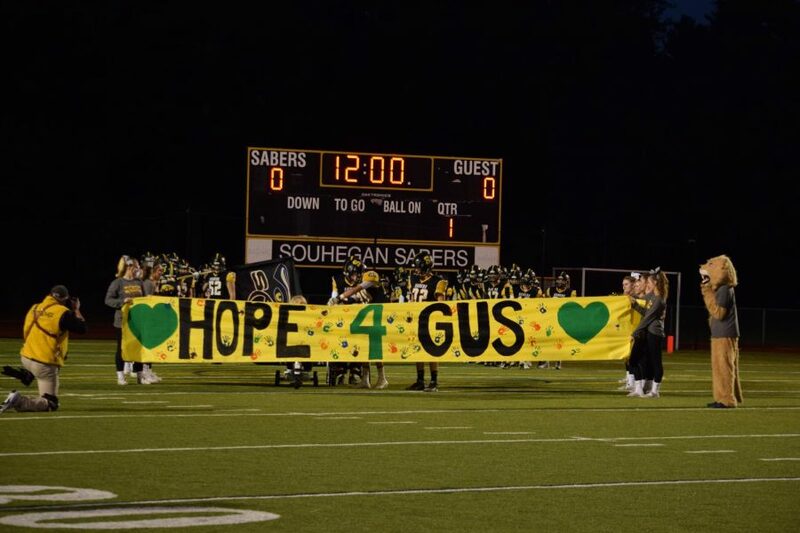 A huge gathering of the whole Amherst community coming to show their support for the Hope for Gus foundation was a sight in itself. It seemed like it was one of the biggest turnouts so far. As the Hope for Gus foundation celebrated its eighth anniversary of raising money for DMD, the whole town seemed to be at that game. I spoke with Dan Wyborney shortly after the game to see what how this year’s turnout was for him and his department. “So I understand this is your first year as the athletic director in support of the Hope for Gus Foundation at Souhegan. What does the turnout of tonight’s game mean to you? As the seniors passed by, hopeful of the future of the foundation as their last memorable home game came to a close I had the chance to sit down one on one with the charismatic senior captain as he was hugged and praised by the many fans and parents in the crowd. As the senior leaders soaked in the last parts of the game, they seemed to be full of hope. Full of pride for giving their all despite the tough loss, but excited for the future of the program at Souhegan. The team wishes for more years of the event to come, and hopefully someday come back to watch the progress and succession of this incredible event. 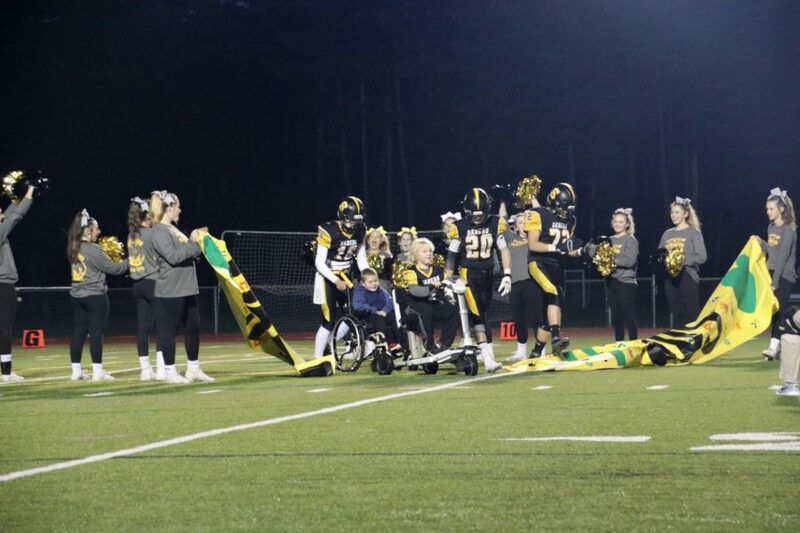 Thousands were raised for the Hope for Gus foundation all week, calculated by the number of touchdowns scored by Souhegan, as well as all of the work put into dedicated staff and students. Stained with dirt and sweat, the players were ever so eager to see the look on Gus’s face running out on that field. An unforgettable moment in their lives, one that will be cherished by the fans and team for many years to come. Gavin Urda scrambles for a 28 yard gain. Tyler Hall receives a 58-yard touchdown pass. Samson Hodges of Milford leads the game in three sacks. The Souhegan Sabers next game will occur Saturday, October 6th at 3:00 p.m. coming in with a 2-3 record. 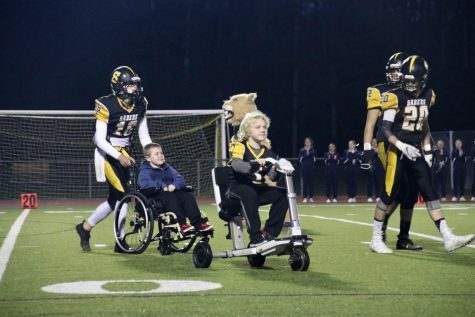 Gus Dreher and his friend lead the Souhegan football team to the sideline before the game.